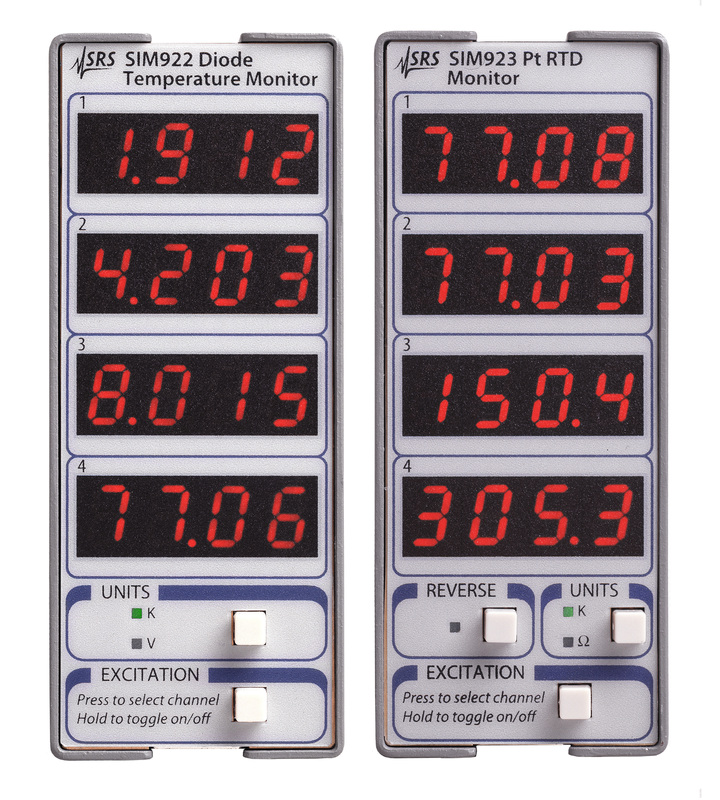 The SIM922 Diode Temperature Monitor and the SIM923 Platinum RTD Monitor are designed to measure four sensors simultaneously. 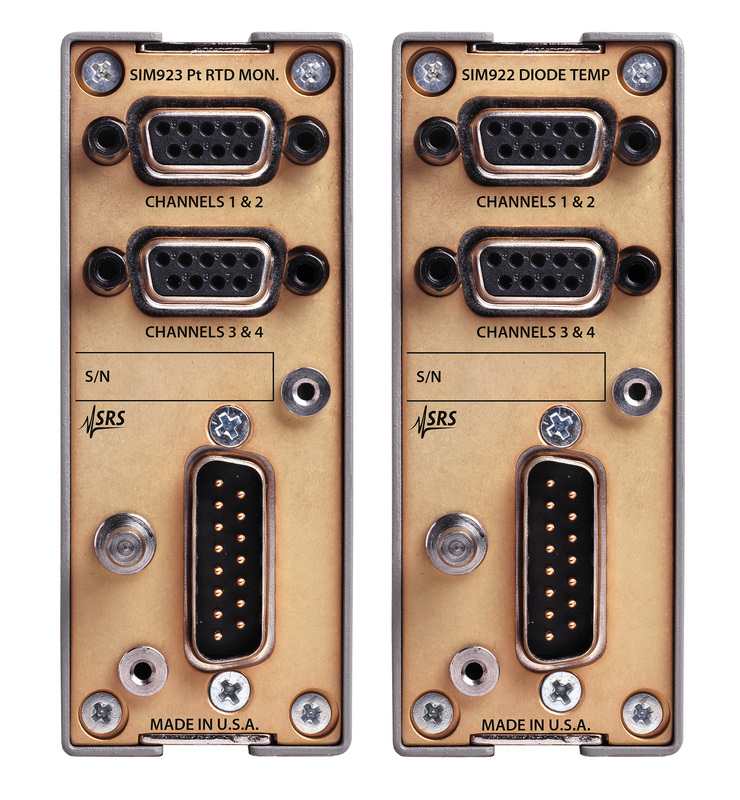 Based on the modular SIM platform, they provide high-performance and multiple-channel capability in a small footprint. Each of the four channels in the SIM922 has an independent, precision 10 µA current source to provide sensor excitation. Measurement results can be displayed in either kelvin or volts. The four channels in the SIM923 have independent, stable 1 mA current sources to provide sensor excitation. Sensor resistance is determined ratiometrically with a half-bridge circuit consisting of the sensor and an internal reference resistor. The current to the sensor can be reversed by the user to test for any offset. Measurement results can be displayed in either kelvin or ohms. Both the SIM922 and SIM923 employ four-wire measurement circuits (±I excitation leads, ±V sense leads) making the measurements insensitive to series lead resistance. The four channel excitations are independently controlled and do not switch on or off when the readout is advancing between channels. Sensor excitations can be disabled to reduce power dissipation at sensitive cryogenic stages.This also accelerates readings in the remaining enabled channels. Measurements are performed at rates up to four readings per second. A factory-standard calibration curve is built in for each model. In addition, each channel has non-volatile memory to store a 256-point custom calibration curve to convert sensor units (V or Ω) to temperature units (K). Results are displayed on easy to read 4-digit LED displays. Full remote operation is available over the serial interface.